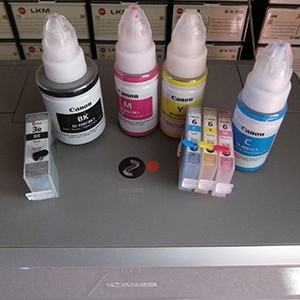 Discussion in 'Canon InkJet Printers' started by PeterBJ, Nov 6, 2018. I think the printer was not used because of the problems with the timing strip, and the clogged nozzles were caused by the printer not being used for one and a half year. So one little blob of grease caused the printer to be dumped. palombian and stratman like this. for your amazing photos and information. Here is my update. 1. I tried connecting the MP620 via USB cable to an old Desktop. Installed printer ran it and it worked fine. That proved that the timing strip was not at fault. However there must be a problem with the HP laptop. I downloaded various versions of drivers i.e. Windows 7 and 8.1 but it did not make any difference. Other suggestions from the Web did not work either. Nice to hear that the problem was a software or setup problem and that the printer is OK.
To get the timing strip just send me your name and postal address in a conversation. If you are not familiar with the conversation system then see this post by @stratman for an instruction.